Hemiscolopendra marginata (Eastern Bark Centipede). Size: approx. 12 mm. Photo: 09/16/17, 2 pm. Okay, this strange, little alien hitchhiked on my pants into out house. I've counted 20 (21?) pairs of legs that moved in a beautiful wave-like motion. 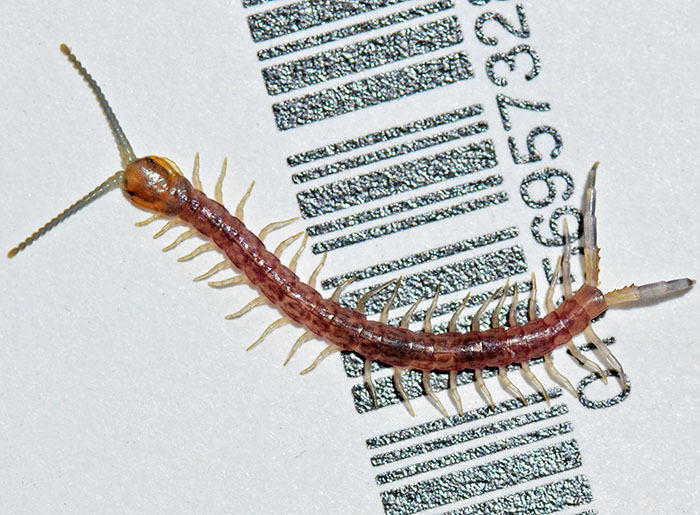 Like in other centipedes, the first pair of legs evolved into venomous fangs. This specimen must be young because the maximal body length of this species is about 3". They are commonly found under loose bark and logs. The second link states that "Bites from tree centipedes are painful but not much worse than a bee sting."